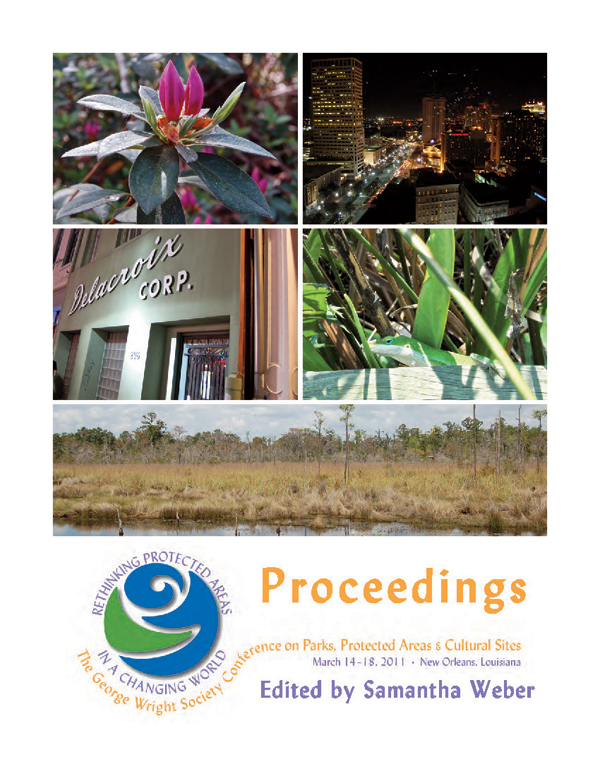 Rethinking Protected Areas in a Changing World is the proceedings volume from the 2011 GWS Biennial Conference on Parks, Protected Areas, and Cultural Sites. The book (423 pp.) is published in digital (PDF) format only. You can download the whole book or individual papers. Links below. Cover photos courtesy of Samantha Weber. Weber, Samantha, ed. 2012. Rethinking Protected Areas in a Changing World: Proceedings of the 2011 GWS Biennial Conference on Parks, Protected Areas, and Cultural Sites. Hancock, Michigan: The George Wright Society. Prescribed Fire in Wilderness: Nature or Nurture? Could Ecotourism be an Effective Tool for Wetland Conservation in Florida?